I was busy booking my events this Spring, and due to flights, I came up with a hiccup in one of my schedules. It meant I had to spend an extra day in New Orleans. This is good news for you, because it means that next month I will be offering a couple of classes that were not on our schedule! 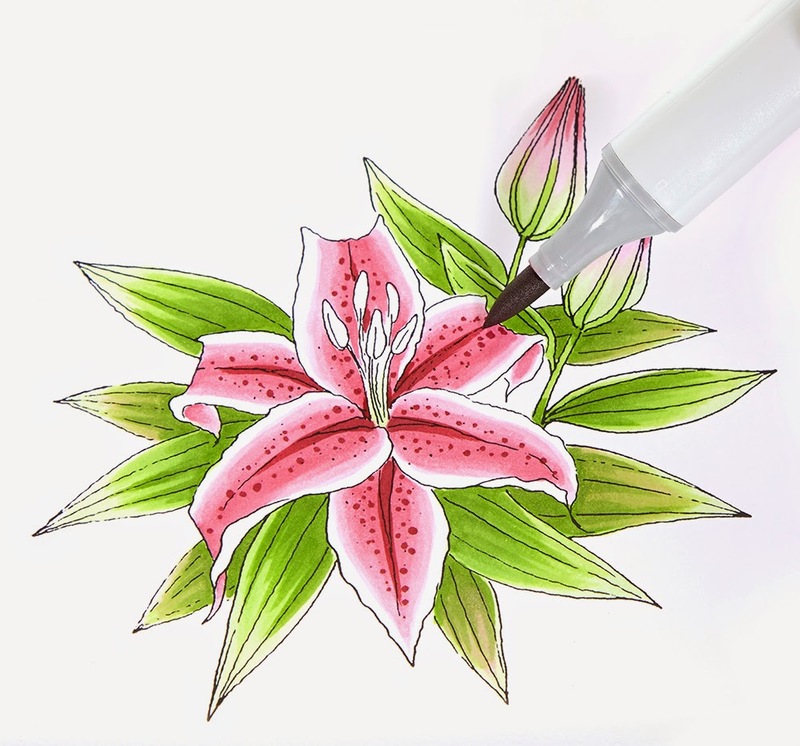 Learn basic Copic techniques as well as some advanced tips for making your flowers look more dimensional and authentic. This special workshop is an introduction to the the beautiful projects found in the upcoming Coloring Flowers book. The book will be released in Spring 2015 as part of a new series of introductory Copic Coloring Books. Attendees will color a few projects straight from the book. All images and supplies provided. 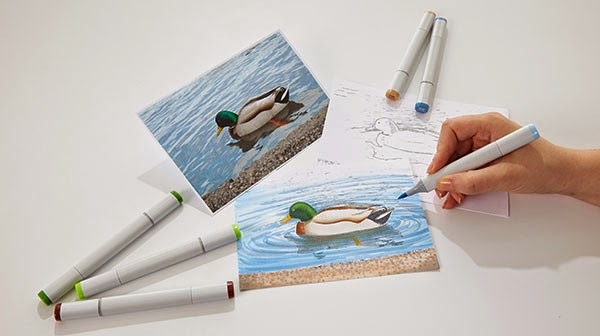 Learn how to convert digital photographs into stunning personal works of art using Copic Markers. This fun and relaxing class is different from other Copic classes. Suitable for everyone—from new beginners to advanced Copic users. You’ll be coloring frameable 5 x 7” artwork, created from photographs, while learning coloring tips and techniques along the way. Learn how to easily match colors and quickly color larger areas. All supplies provided. As many of you know, I really like mazes. I like to draw them, and have loved drawing mazes since middle school. 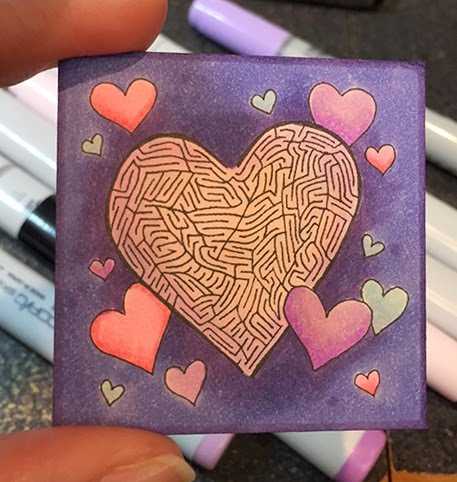 So, when we were asked to do a fun project for the Inchie Blog Hop, I knew I should make a Valentine maze. I started with a 2" Inchie Arts Matboard square in a light cream color. 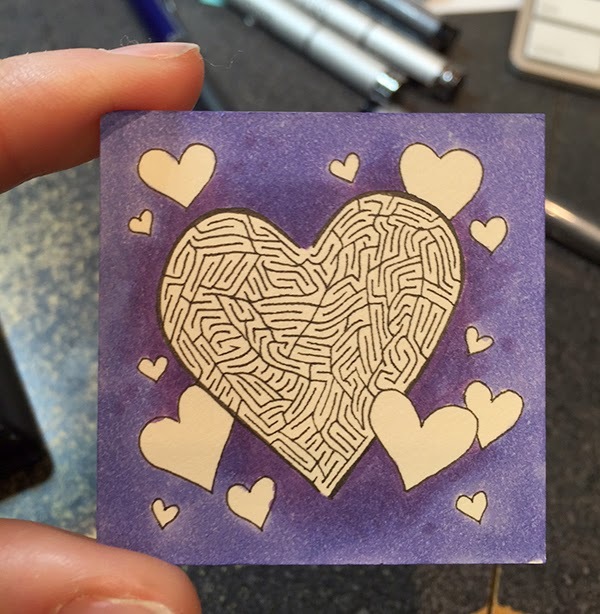 I grabbed my fine little 0.03mm Multiliner and started drawing my Valentine maze. Just so you know, there is a solution to this maze, I don't know what it is, but there IS a solution! It took me a couple minutes to finish drawing the maze. Now for color. Mat board is a bit softer fibered than the papers I usually work on, so I wanted to do as little blending as possible in order to prevent bleeding. I've played with Inchies a lot over the last few years, so I knew that I could get away with starting dark and adding my light back in, and that would prevent bleeding more. I started with a dark purple "glow" to the background with V17. I kept the edges rough so they will be easier to blend. Just so you know, the color dries lighter than you think on this surface, so I added another coat of color after the base coat had dried. This helps me get the darkness I want. Next I came in with my lighter, BV13 to blend the V17. I was careful to avoid over-soaking the paper, as I wanted the other hearts to be lighter. Then I proceeded to color and blend the smaller hearts as I usually would, starting light and adding dark. 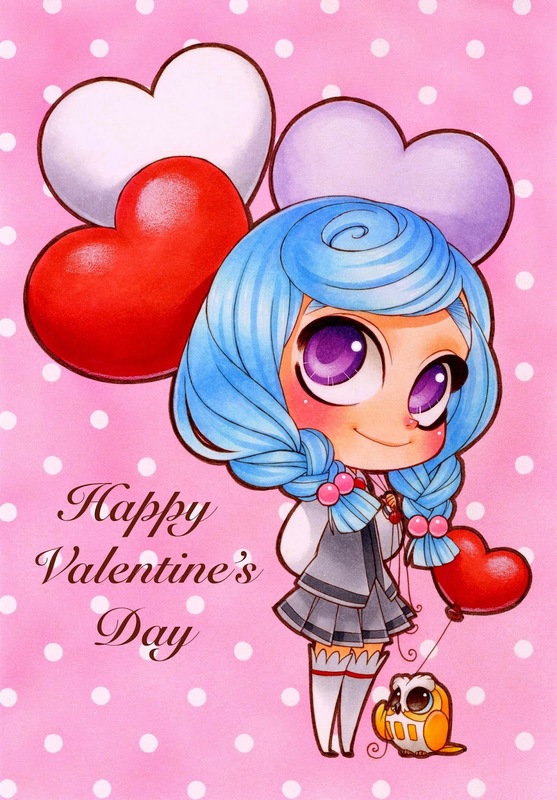 I finished my cute little Valentine by coloring a piece of ribbon with my V17 marker and glued it on the back using the X Press It Gel Glue. I know that my secret Valentine at work today would love it! (I had to wait to post this in case she saw it online before she made it to work today). 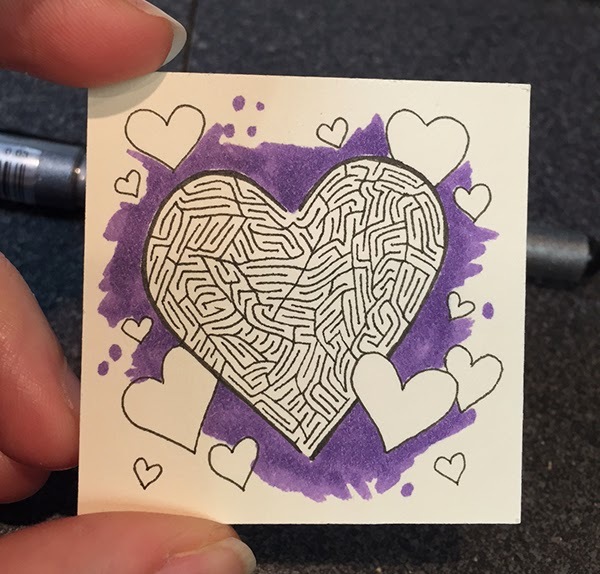 She is an aMAZEing person, so she totally deserves a cute little maze valentine. Remember, if you are local, stop by the Oregon Asian Celebration this weekend to see the Copic demos in the Youth Art Room. I hope you have a very happy Valentine's Day. Be sure to give something handmade to someone this weekend! Welcome to the Colorful Copic & ART SQUARES blog hop! 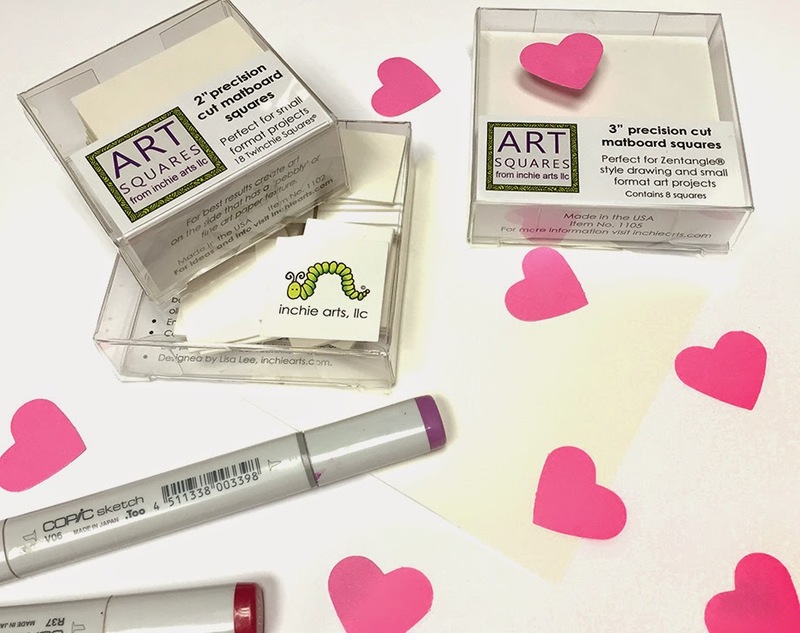 You are in for treat today as Copic pairs up with the ever popular Art Squares by Inchie Arts. There are so many things to love about this pairing! 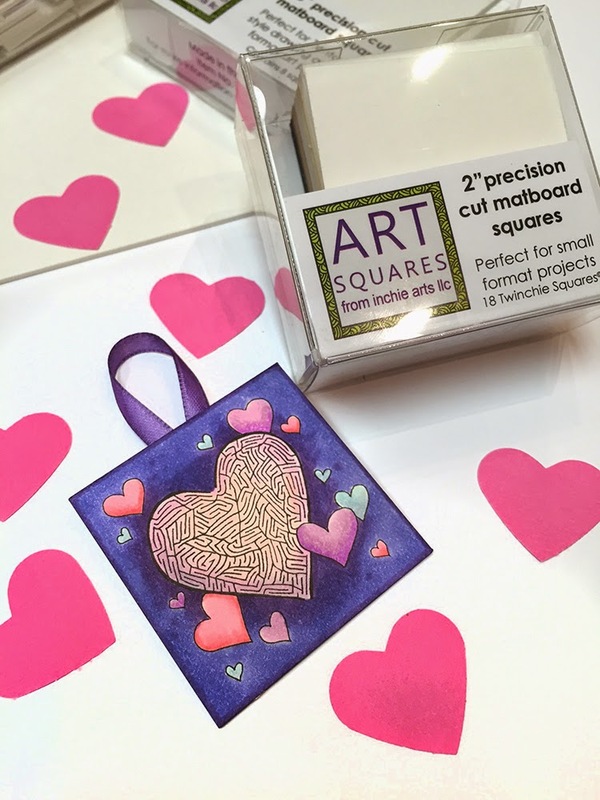 Art Squares are the perfect canvas for creating small-format art! They come in 6 sizes (1 inch, 1.5 inch, 2 inch, 3 inch, 4 inch, and ATC). Art Squares come in 7 colors (black, dark gray, light gray, kraft, dark cream, light cream and white). They are perfect for wet or dry mediums. Copic markers and inks look amazingly vibrant and deliciously rich on Art Squares! Copic multiliners glide smoothly across the surface. Work on the “top” or toothy side for the best results. You can mix and match your mediums! No warping, bending or curling. You can find more information about both Copic products and Inchie Art Squares at the links below. Hop along with these talented designers as they show you some more interesting and exciting ways to pair up two great products! Marianne Walker- click to see my project! Congrats Maria!! And, thank you all again for participating. 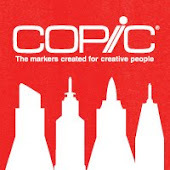 Welcome Jennifer dove to the Copic Fine Art team!! The Copic Regional Fine Art team is a little different than our Papercrafting team. 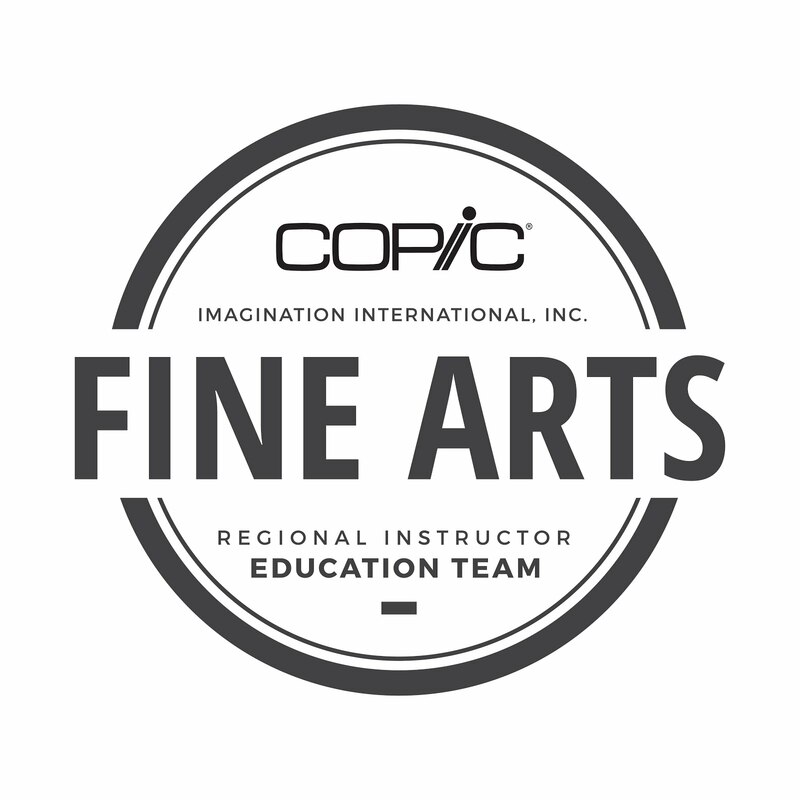 The Fine Art Teaching Team is made up of a bunch of super-talented professional artists and instructors who travel across the country demoing and teaching at fine art stores and art schools. I bumped into Jennifer again a few months ago, (it had been years since I'd last seen her.) We had so much fun coloring cactus! After chatting with her, I was so happy when she agreed to accept the Fine Art team invitation. Jennifer has been using Copics since 2010 and her passion and enthusiasm are apparent to everyone she works with. 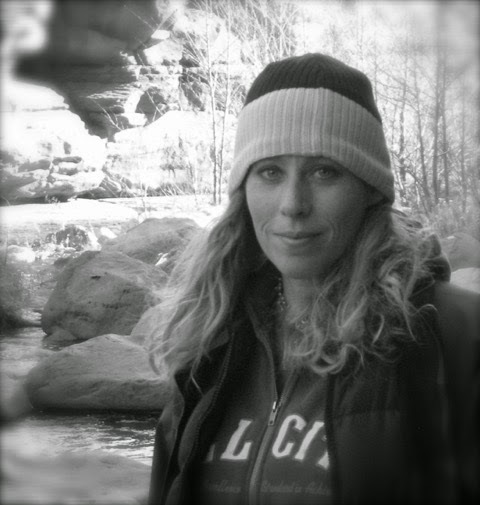 As an artist by nature, Jennifer is currently busy teaching Copic Boot Camp retreats, working on her own DoveArt Designs stamp line, and designing in mixed media, jewelry making, card making and altered arts. She also has a number of video classes available with Annie’s Publishing. She is very excited to be adding this new teaching venture into her line-up. We know that Jennifer will ROCK THE SOCKS OFF of those art schools and stores and we are so thrilled to be able to welcome her to the Copic teaching family. In celebration of Jennifer’s joining us, we want to give YOU a chance to celebrate too. 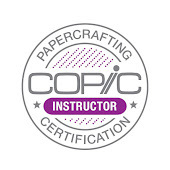 Our current Papercrafting Teacher Team has joined up for a welcome hop and we are EACH giving away a Copic T-Shirt to one lucky winner. To be entered here on my blog, please leave a comment telling me what your favorite Copic color is... just for fun! Comments will be closed at midnight on Sunday and I'll post the winner here on Monday. Visit the blogs below for another chance to win & make sure to stop by Jennifer’s Blog and give her a big welcome! Marianne Walker -- That's me! Soon, we will have regular installments of awesome tutorial Mangas (Japanese comic books) teaching how to use ALL the Copic markers and other art family products imported by Imagination International, Inc. (III- that's us!). Did you know that we sell more than just markers? So, hop over to the Copic website and check out the teaser images for our new III Academy. Meet Chihiro and Alisa, and their fun new III Academy characters. 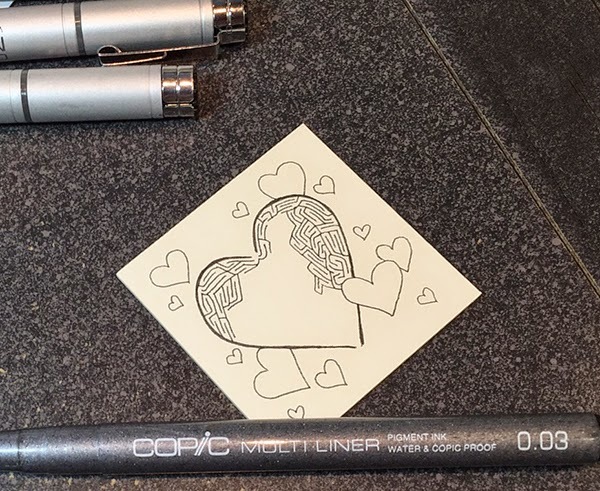 You can also download some free, sweet Valentine images to color. And please, if you stop by the page, leave a comment here for Chihiro and Alisa, letting them know how excited you are as well!